Home Year 2007 Derrick McNeil Deadwyler Jr. When Derrick McNeil Deadwyler Jr. was a child, his father would say the name of his young son in the voice of a boxing announcer and little ?Rick? would raise his hands over his head as if he were the heavyweight champion of the world. ?My father made me believe that I can accomplish anything I want to,? says Deadwyler, who engages in the same pride- and confidence-building exercise with his 5-year-old son. This confidence buttressed Deadwyler as a professional in America?s public and private sectors. Today, as manager of government affairs at DuPont, he oversees advocacy, public policy and business-development initiatives for the company?s mid-Atlantic region. His tenure at DuPont has given him the opportunity to give back to the Delaware community in which he was raised as he served with their philanthropic organization, and later assisted in company?s crisis management planning and response to hurricanes Rita and Katrina. Deadwyler holds a bachelor of arts degree in sociology from the University of Delaware and a masters of education from Wilmington College, Delaware. He is vice chairman of the board of St. Francis Hospital Foundation and sits on the board of Delaware Children?s Museum. 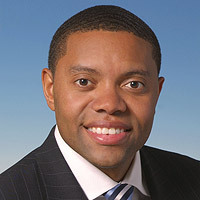 Deadwyler?s mentors include Sylvia Banks, a senior public affairs executive at DuPont, who recruited him to the company, and Stacey Mobley, DuPont?s first African-American attorney, who is able to navigate DuPont?s corporate environment without being distracted by the challenges of race. ?Not being deterred by things that were prevalent at that time, that?s motivation to me,? says Deadwyler. ?It encourages me to excel.? He, in turn encourages others to embrace the same attitude of resilience. Deadwyler would like to open an academy for young urban men from academically and behaviorally challenged backgrounds. ?If everyone had the opportunity to have someone in their corner, teaching them the importance of their name and that greatness is inside them, that?s what is needed for a number of young men and being able to provide that would be a dream,? he says. In his own efforts to develop the next generation, Deadwyler offers the following words: ?Set goals frequently. Focus on them and pursue them with reckless abandon with the belief that you can, and will achieve them. ?